Compared to tiles and carpet, wooden flooring is really the best material you can choose for your home. Not only is wood environmental friendly, it is also economical as hardwood floors will last for decades since a simple sand and seal will make your home look all new again if some boards have been scratched or simply worn out after a couple of decades. Wood floors are also easy to clean by brushing, vacuuming and damp mopping and especially when the household is shared with children and pets very much more hygienic than carpet. Especially European oak flooring has a warm and timeless appeal that goes well with any interior design hence it does not come as a surprise that real estate agents affirm that homes with wooden flooring have an increased value and sell twice as easily compared to other floor finishes. Once you’ve made the brilliant decision to install solid wood floors in your home, there will be more choices to be made in terms of what kind of wood, timber floorboards or engineered oak flooring, the colour and especially the board size. One of the secrets of interior design is, that one should always choose the board size according to the proportions of the space as the wrong plank size can have a huge visual impact on the room making it either appear smaller, busy or out of proportion. The right balance in board width will improve the size of the room and make it appear in unison with the wall and windows. Most flooring companies will manufacture board sizes between 120mm – 400mm at various lengths but as a rule of thumb, the thinner the board, the busier the look. And the wider the board, the cleaner the room will occur. If you have a home with larger open-plan areas as well as smaller rooms it might be wise to consider using different floorboards sizes and not stick with one width through the entire home for the most proportioned look. Larger board formats are great for the open areas and smaller ones for the bedrooms. The average board width is about 150-200mm wide and will favour small to medium-sized rooms as the plank size helps small spaces to appear bigger and more spacious. This size gives any area a contemporary linear effect and if the flooring is layered diagonally across the room it will also make it look bigger. 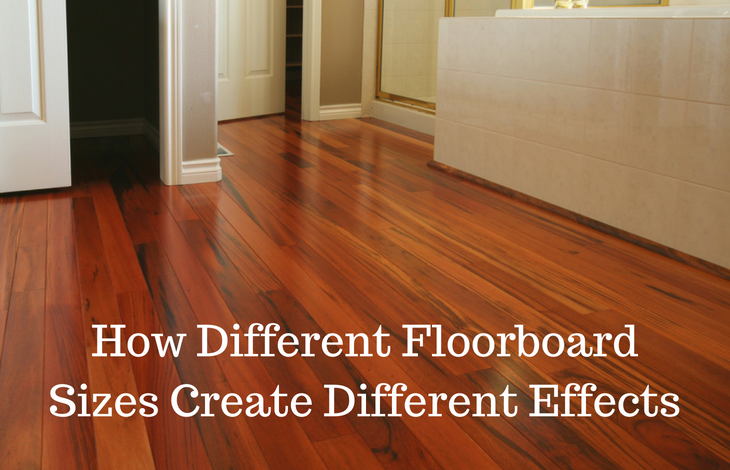 A wider board will fit best in large rooms and open-plan areas as mentioned before. Using a large board will help the space to look less cluttered and busy. Wider planks also give a rustic feel to a home and a lot of people choose long and wide timber floorboards as the size really shows off the decorative grain and natural features. Narrow planks come in sizes 85-150mm wide but are not used often anymore as they make rooms busy and overloaded due to the breaks in the grain and more joints. If you want to make your home more individual and would like to find a solution for areas of heavy traffic such as entranceways, halls and steps, take a closer look at parquetry options. Popular for centuries due to its classic look, parquetry patterns make it possible to just replace single blocks when damaged. A highly modern look can be achieved when using light colours such as Bistre or Ardesia to form popular parquetry patterns such as herringbone and basket weave. Not only will hardwood floors make your home look amazing, if a dark colour is chosen in combination with larger boards it will make any space look bigger especially when paired with the proper wall colour which should be a cool hue to expand the room visually.